You experience what it’s like to see through the eyes of a hungry, 45 foot long shark with a brain that’s three times the normal size of a shark’s brain. Which, I’m pretty sure means that it’s still not as smart as a hamster, seeing as sharks are pretty much mindless. You see a shark fin. Someone talks about science or performs some science. We’ve gotta cure Alzheimer’s, people, and we’ve tried everything and it keeps coming back to hyper-intelligent sharks. 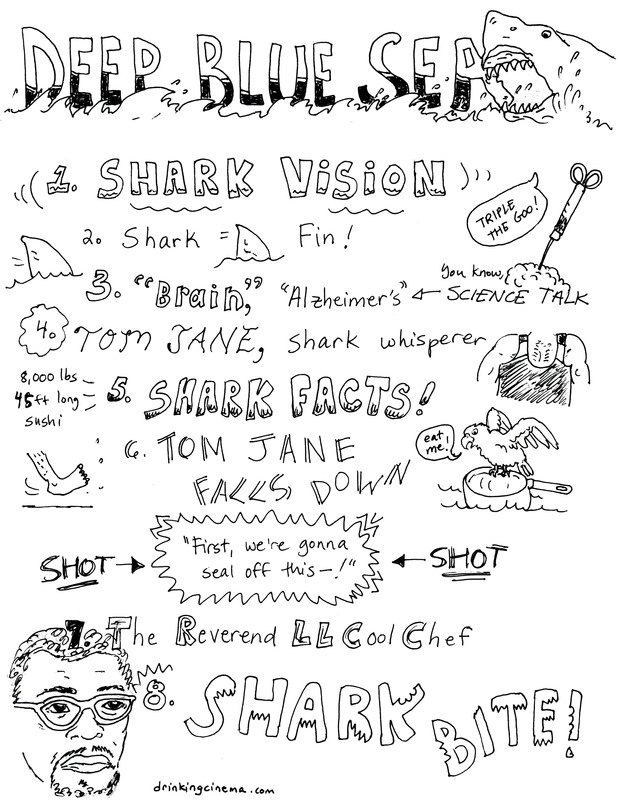 Tom Jane marvels you with his ability to understand the shark psyche and swim with the sharks. He just “gets” them, you know? LL Cool J teaches us the ways of the body, spirit, and kitchen by quoting bible verses, cursing, and giving us some recipes. A shark bites something. Anything. Drink every time you see LL’s bird. Take a shot (or just finish your beer) when Samuel L. Jackson gives his famous speech about working together. It’s important to work together, especially when you’re trapped in a shark-infested middle-of-the-ocean scientific installation…or an avalanche. I mean, we like to party. BTW, Dollar Shave Club looks awesome. Good work (I know it's not yours, but good work for using it as your website). site looks good ya [great guy].